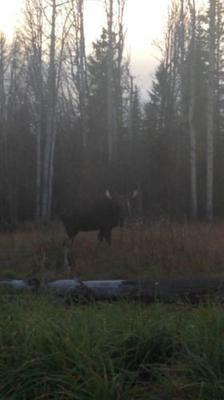 Later on during the rut last year I was on my way home from work when I spotted this bull moose on a cut line. I actually have a video of me sneaking up on him, an in the other picture you can see he had a cow an calf with him. Well the next day on my way home from work I passed a truck with that bull in the back of their truck, an I had gone a few more miles down the road an the cow an calf ran out in front of my truck! The cow was the one who hit my truck an the calf ran back in to the ditch, both moose walked away an I got to drive my truck home. That can be the way it goes eh? Someone else gets the meat! Haha! 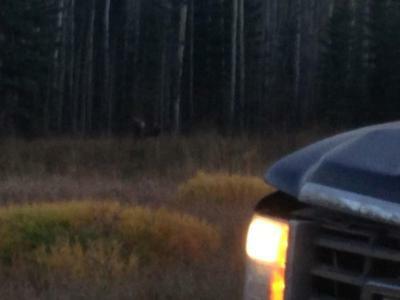 You were very fortunate not to have had more damage to your truck and not to be injured yourself as a result of your collision with a moose! So many times moose end up on the hood of the vehicle and end up coming right through the windshield, injuring the occupants. Possibly your story would be written very differently if you had been driving a car?